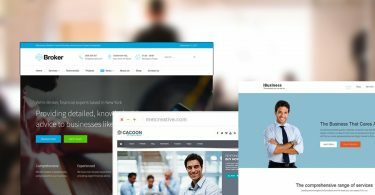 In this post, you will find best CMS WordPress Themes designed to transform your simple website to powerful Content Management System. 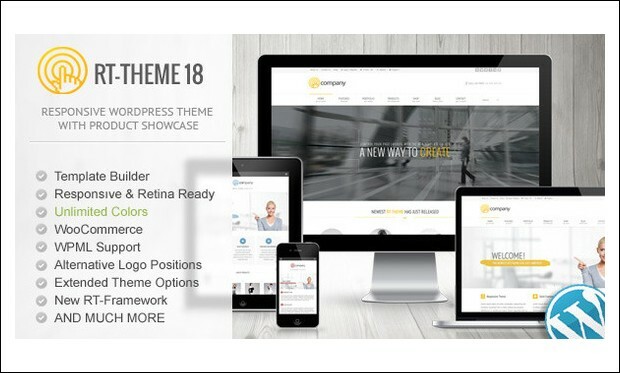 These themes come packed with extended features to help you create your own site in a professional way. You can easily setup and customize the theme within few minutes to suit your needs. The responsive feature of these themes improves the appearance of your site on PC, iPhone, iPad, tablets, laptop and smartphones. 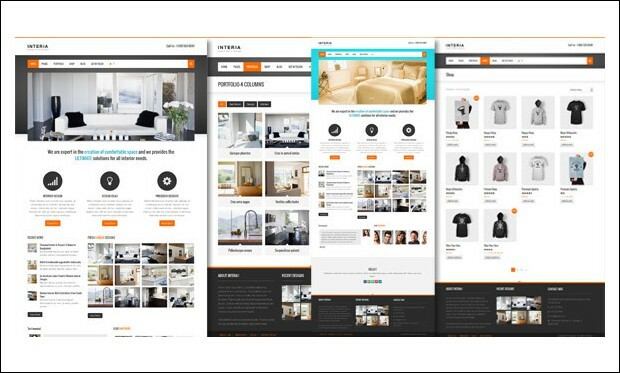 With these themes, you can build a fully functional community, wedding, corporate, business and online store websites. 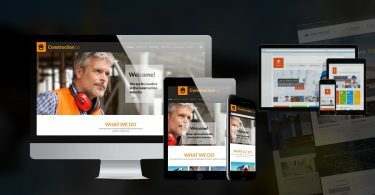 Here are the Top 30 Responsive CMS WordPress Themes that you can consider for your website. 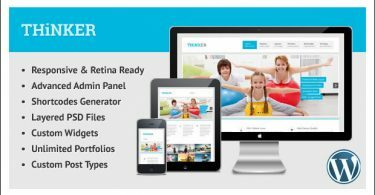 Interia is an ultimate CMS WordPress theme that has been responsively designed to make your site look fabulous on all devices. This theme is programmed using HTML5, CCS3 and jQuery techniques. You can build unique web pages quickly with the help of light weight SiteOrigin page builder. It supports child theme and is WPML ready and translation ready for creating multilingual websites. 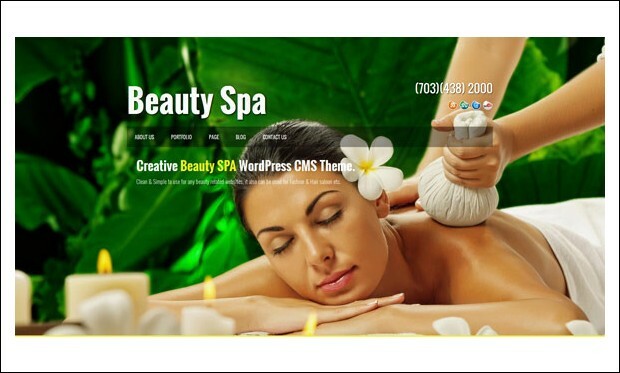 Beauty SPA is an attractive and eye-catchy theme that is powered by the WordPress CMS. This theme is suitable for photographers, models, portfolio and gallery websites. Create unique web pages by simply dragging and dropping the custom widgets using the powerful page builder. You can import XML demo content within few seconds. It is SEO optimized to allow search engines to quickly crawl and index the site. 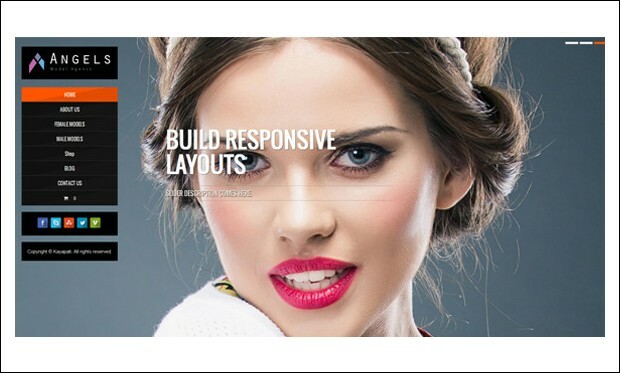 This beautiful CMS WordPress theme is built with HTML5 and CSS3 technologies. Angel theme is designed for creating artistic showcase, portfolio, fashion model and photography websites. It is WPML and translation ready for translating posts, pages and other elements of the theme to other languages. Different custom post formats are standard, gallery, link, quote, video and audio. 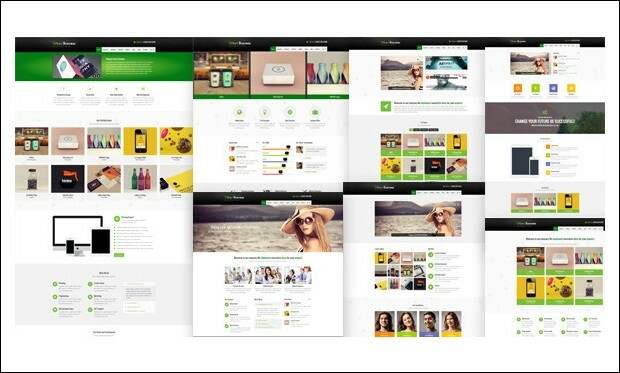 Green Business is a clean and simple CMS WordPress theme especially designed for building corporate and business websites. You can enable or disable the responsive mode of this theme based on your requirement. It supports WooCommerce integration for selling products online. This theme is well documented to help you get started with your own site in no time. SPA Salon is a premium CMS WordPress theme that comes loaded with simple and easy to use features. This fully responsive theme looks and works great on devices from large desktop computer to small mobile devices. Use SiteOrigin page builder for building multiple page layouts in a matter of few seconds. It supports child theme and custom background images. It’s a fashion model agency WordPress CMS theme from Theme Forest. 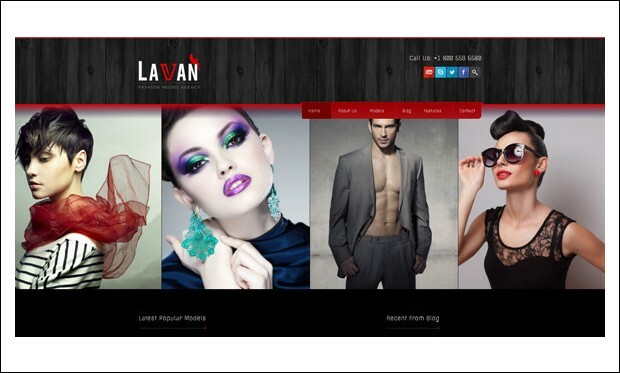 Lavan theme is designed for building model, portfolio, gallery and photography websites. You can customize each and every element of the theme by using theme customizer and preview the changes made to the theme in real time. It is SEO ready and tested to work well with Yoast SEO plugin. 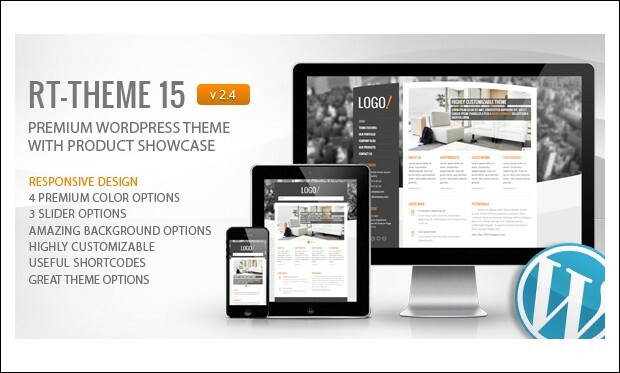 This CMS WordPress theme is suitable for creating interior, furniture, home decor, business and portfolio sites. Different page templates are blog, contact page, full width, left sidebar and portfolio pages with 2, 3 and 4 columns. Customize the theme via user friendly theme options panel. It features dynamic thumbnail to resize images uploaded on the website. 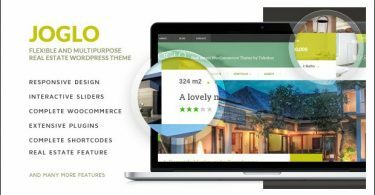 iFolio is a clean and elegant CMS portfolio WordPress theme that has been crafted with HTML5 and CSS3 latest techniques. This theme is well suited for creating photography and portfolio websites with ease. You can even build an online store website as this theme fully supports WooCommerce plugin. It is equipped with .po and .mo files for easy translation of the website. 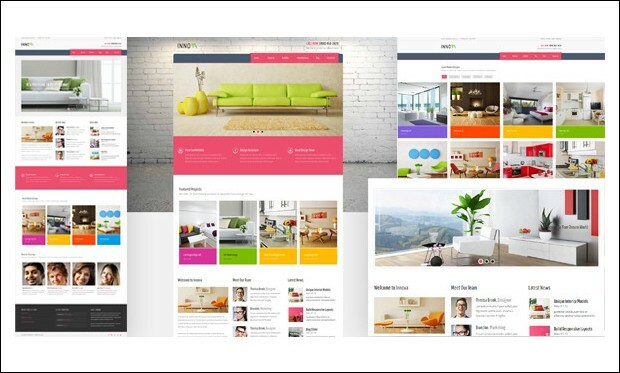 It’s a responsive and retina ready WordPress theme that has been developed using the powerful CMS tools. With the help of built-in template builder, you can create your own custom page templates for posts and pages. If you face any issue then make use of the extended documentation and step by step screencasts. 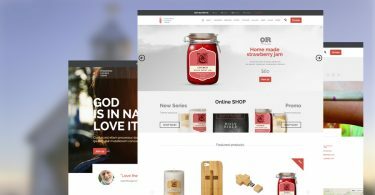 The theme is WooCommerce ready, localization and WPML ready. 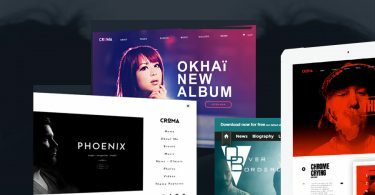 This powerful CMS WordPress theme would be a perfect choice for building product catalog, portfolio, services, business and corporate websites. Due to its responsive design, the theme automatically resizes on the browser window of tablets, desktop computer and smartphones. The theme is SEO optimized and cross browser compatible. It is internationalization and translation ready and even supports Right to Left (RTL) languages. This fully responsive theme can be used for creating product catalogue, services, business, corporate and portfolio websites. 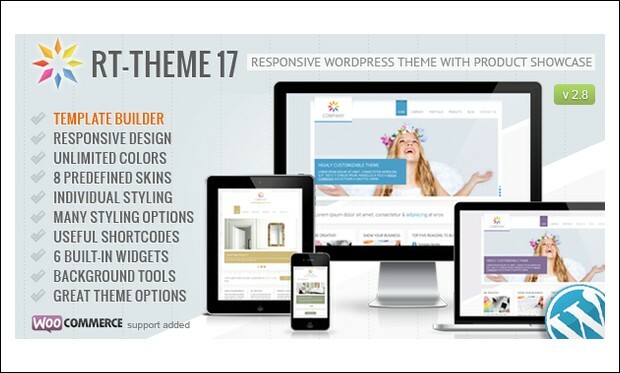 It is built on RT framework and comes packed with lots of useful features for easy creation and customization of the theme. Use custom admin panel to customize various elements of the theme. 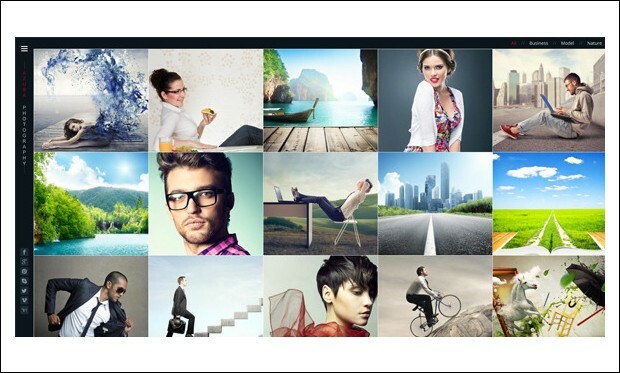 This flexible theme lets you add unlimited photos for single product and supports custom sidebars. Powered by bootstrap 3 framework, Industrix is an amazing CMS WordPress template. This theme is coded with HTML5 and CSS3 techniques and includes child theme. Get started with your own site by quickly installing and setting up the theme with its one click demo installation feature. It is highly customizable to suit various users taste and needs. 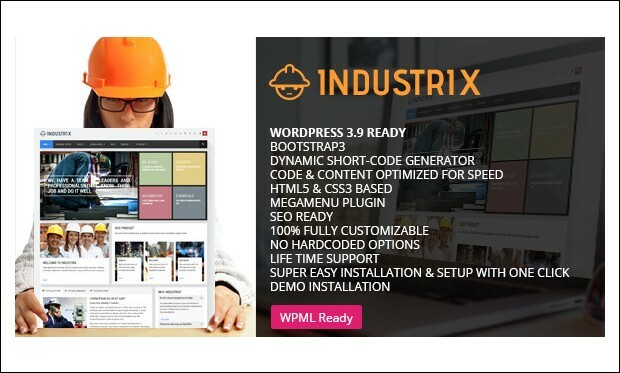 Industrix theme is compatible with major plugins out there. This bold and bright coloured theme would be an ultimate solution for all those who wish to build a powerful business website. WYSIWYG content composer is a unique feature of this theme to help users build multiple page layouts by simply dragging and dropping the controls. Halsey theme comes packed with revolution slider, layer slider, jackbox and isotope plugin for portfolio. 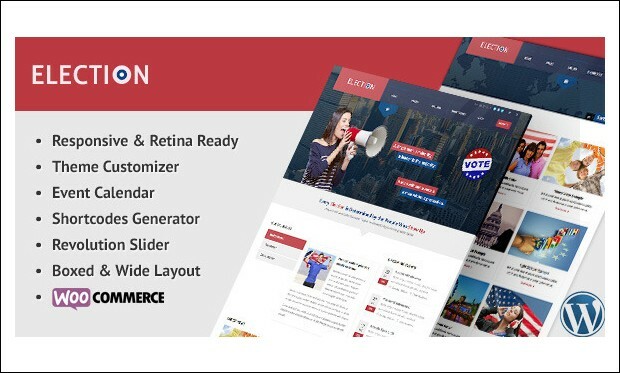 Election is a fabulous WordPress theme that features responsive and retina display ready to enhance the appearance of the website on various screen sized devices. 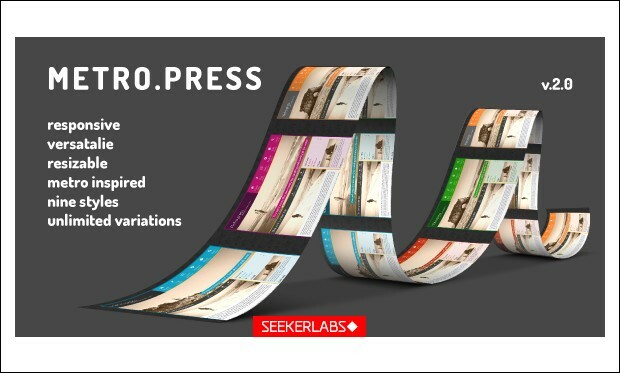 By using revolution slider, you can build multiple slides with stunning animation effects. You can change every aspect of the theme and preview the changes in live environment with the help of theme customizer. 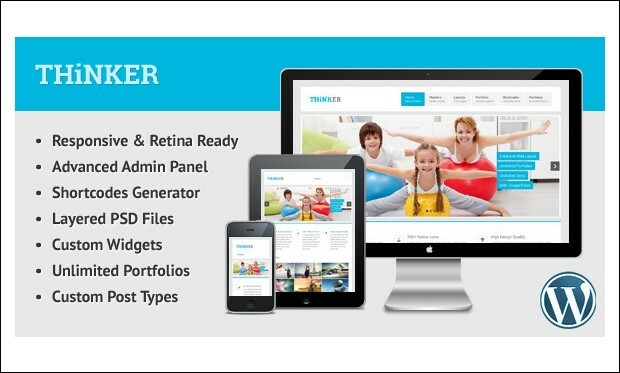 Thinker is a beautiful WordPress theme with powerful CMS functionality. 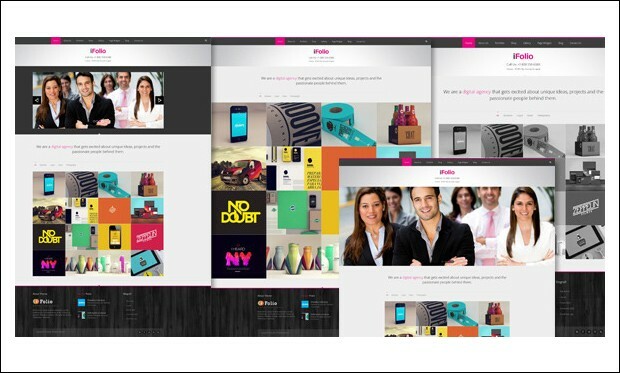 The theme looks sharp and pixel perfect on all screen resolutions due to its responsive and retina ready design. It includes layered PSD files for easy customization of the website. Design every element of the theme without touching even a single line of code using advanced admin panel. 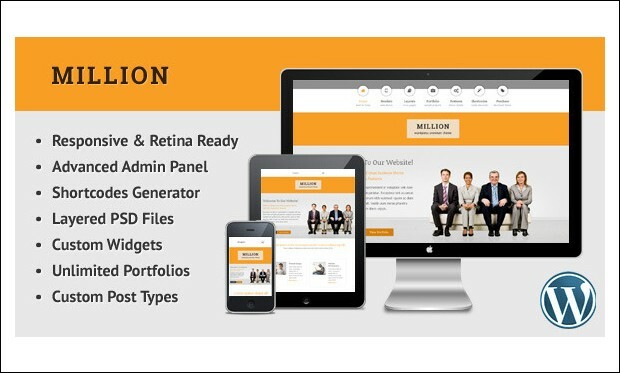 Million is a multipurpose WordPress theme that is coded using HTML5 and CSS3 techniques. It is compatible with WPML plugin for translating posts, pages and other aspects of the theme to multiple languages. Give your site a unique look and feel by choosing from 6 home page variations, 600+ Google fonts, 4 header styles, 5 menu styles, unlimited skins and 6 services styles. 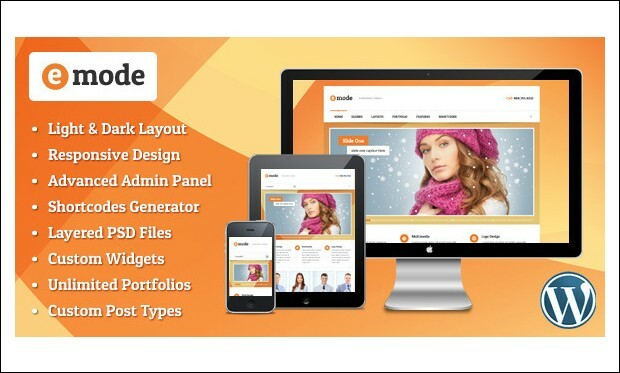 emode is a bold and attractive WordPress theme designed to grab visitors attention towards the website. It features powerful CMS functionality and would be a great choice for creating businesses, corporations and creative portfolio websites. You can choose from boxed and full width layout to make your site look unique from the rest of sites. It includes layered PSD Photoshop files for easy customization of the site. 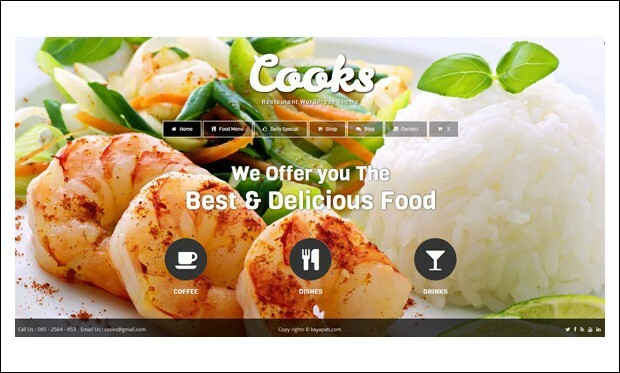 This restaurant WordPress theme is designed to impress visitors the minute they land on the website. Powered by CMS, this eye-catchy theme comes with CPT food menu, reservation form, and tabular food menu. You can import the XML demo content including blog posts, portfolio posts, images and dummy text within a matter of few minutes. It supports WooCommerce integration into the website. This premium theme is powered by the WordPress CMS and would be a great choice for building portfolio, corporate and business websites. Design your site by using 14 premade skins, unlimited portfolios and galleries with 3 unique styles and 140+ shortcodes. It supports child theme and compatible with WPML plugin. It includes pre-installed PHP script for dynamic image resizing. It’s a photography portfolio WordPress theme that comes loaded with flexible and easy to use features. By using full screen slider, you can add full screen backgrounds and parallax background images to impress visitors and convince them to stay on the website for a longer time. This theme is coded with HTML5, CCS3 and jQuery technologies. It is SEO optimized and WPML ready. 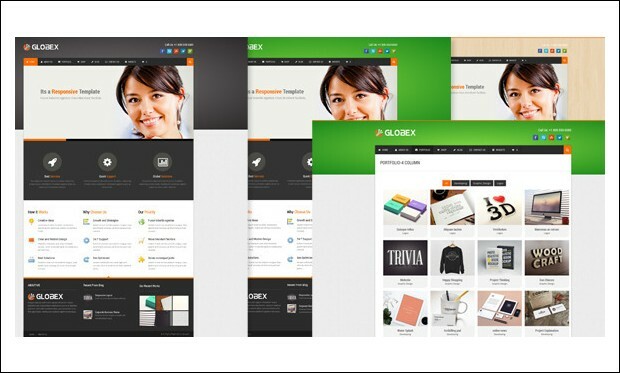 Globex is a responsive WordPress theme that is powered by the CMS functionality. It supports WooCommerce integration into the site for selling products or items online. This flexible theme allows you to turn on or off the responsive mode of this theme. It is SEO optimized to help search engines quickly crawl and index the website. It is compatible with WPML plugin for creating multilingual websites. 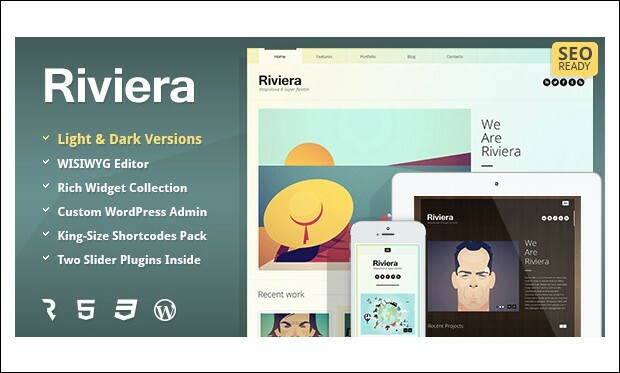 Riviera is an elegant and smart portfolio theme that is compatible with the modern version of WordPress. By using visual drag and drop content editor, you can easily manage the website content by resizing and editing it. It is built with advanced SEO options to improve your website rank on different search engines. You can insert sliders, tables, featured blocks and media with the help of WYSIWYG content composer. 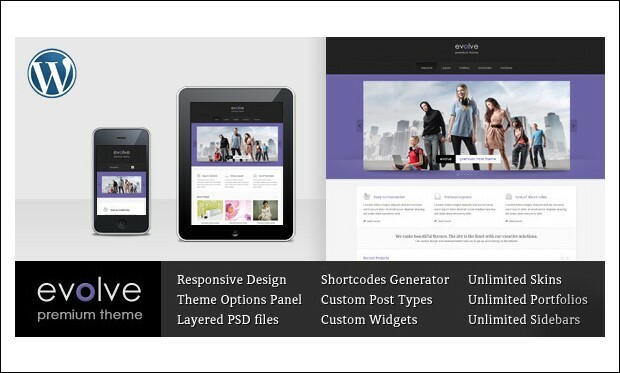 Evolve is creative and attention grabbing WordPress theme based on powerful CMS tools. It includes 7 custom post formats such as standard, image, gallery, link, aside, video and quote. You can quickly setup the theme by importing the XML demo content without any coding knowledge. Use theme options panel to add logo, set colour schemes, import Google fonts, track Google analytics and manage portfolio and blog settings. 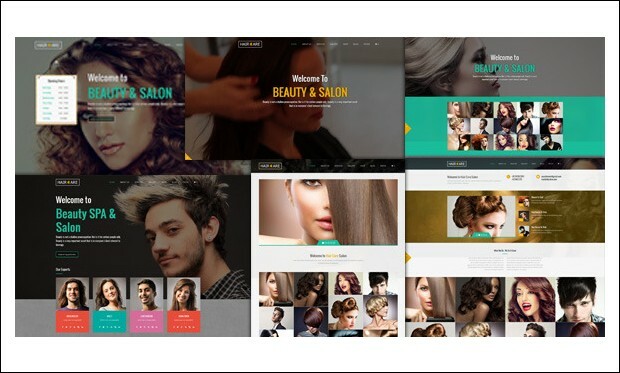 It’s a creative and beautifully designed multipurpose WordPress theme that can be used for creating hair salons, beauty salons, beauty spa and other similar kind of sites. By using light weight SiteOrigin page builder, you can build unique page layouts instantly. Key features are theme customizer, SEO optimization, responsive, custom sidebars, page title bar and child theme support. 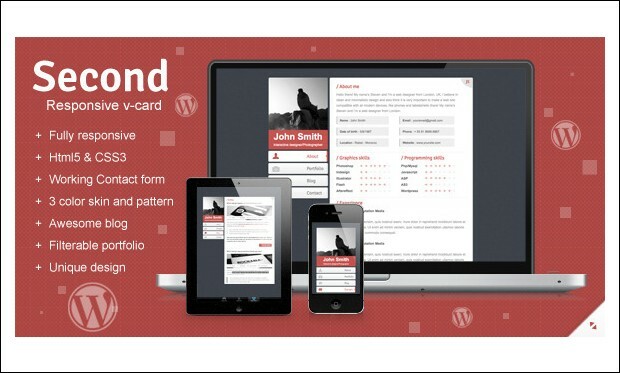 Second is a highly customizable v-card and portfolio WordPress theme from Theme Forest. Built with HTML5 and CSS3 techniques, this theme comes loaded with simple and useful features. It is equipped with a working contact form with live validation. Style your site with 3 colour skins and 3 background patterns. You can integrate Google maps onto the site to provide visitors with driving directions of your work location. This versatile and metro inspired WordPress theme is powered by Warp framework and boasts powerful CMS features. Metro.press theme is programmed with HTML5, CSS3 and PHP web techniques. It comes integrated with Google analytics and supports child theme. Make your site stand out from the crowd as it includes 9 predefined expressive colours and style variations. 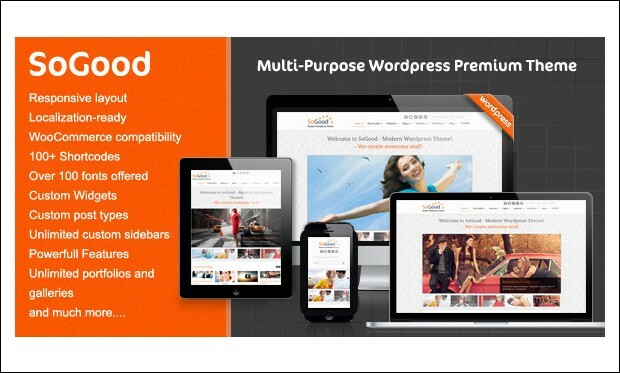 SoGood is a stylish WordPress theme that comes loaded with lots of useful features. It features advanced CMS options, responsive layout, WooCommerce compatibility, shortcode generator, Google maps and search engine optimization. 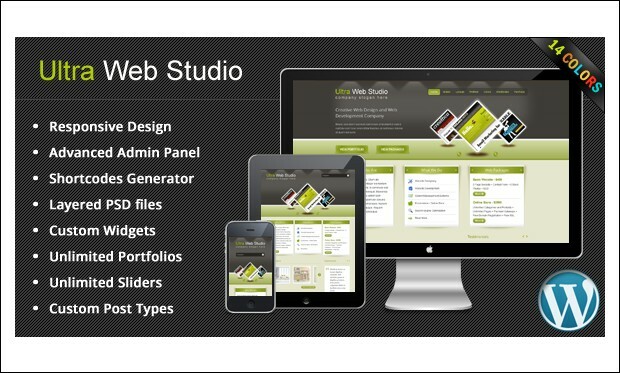 This theme works well for both novice users as well as advanced web developers to customize and setup their own website. 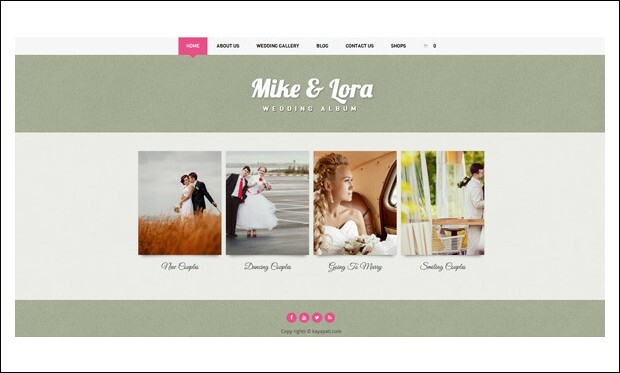 Wedding Album is a clean, simple and feature rich theme powered by WordPress CMS. This theme is suitable for creating wedding album, wedding gallery, wedding ceremony and other similar kind of websites. Impress your visitors by using full screen slider with slide or fade effects. It is translation ready and WPML ready. You can create multiple page layouts by using page builder widgets. 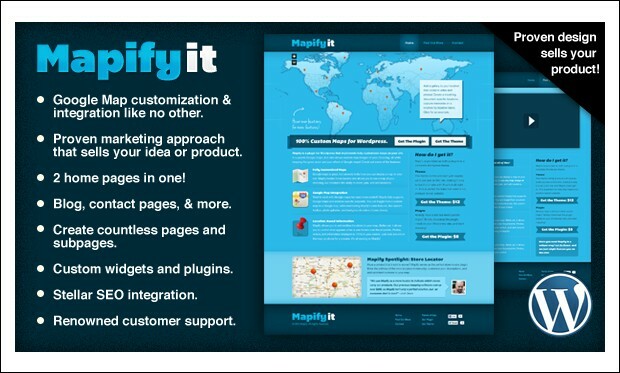 Mapify.it is a powerful CMS WordPress theme designed for selling products or ideas in a professional manner. Start building your own site and sell more products with huge conversion rate. You can integrate Google maps into the site to help visitors track your location. This theme comes with pre-styled contact page and contact forms to help customers contact their website owners. Smack is a clean and simple responsive WordPress theme crafted on intelligent framework. Beginners as well as WordPress professionals can easily customize the theme to suit their needs. It is equipped with All-in-One SEO Pack plugin and features unbranded white label administration panel. 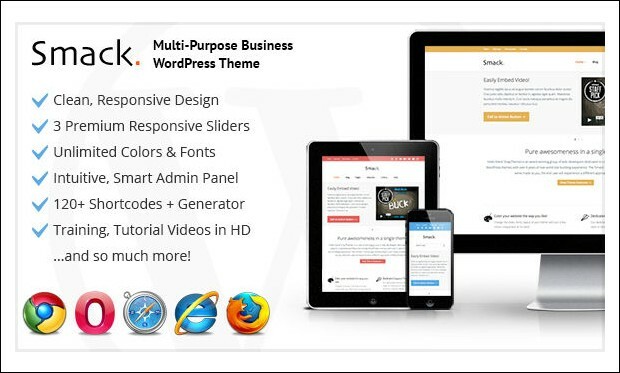 This theme also includes layer slider and revolution slider plugins.